The Bannockburn Bowmen Open SRS/Thistle Status FITA and Metrics competition (incorporating the Bannockburn Bowmen Outdoor Club Championships and CSSC Scottish Regional Championship) took place on Saturday 11th June, 2011 at Strathallan Games Park, Airthrey Avenue in Bridge of Allan. 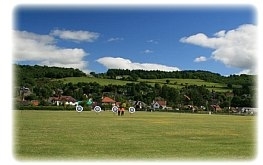 Thank you to all archers taking part. Full results can be downloaded here.